The driver for this unexpected artificial intelligence (AI) industry sector is the autocratic government's massive multi-billion dollar, ultra-high tech, industrial plans and its fervent development of higher education to support them. Today, there are over 30 official universities and 130 or so polytechnics, most of them emphasizing technology. Many of them are in the capital and, in 2012, the Ministry of Science and Technology established its own university and a $250 million dollar tech park nearby. Despite all the tech glitz, however, Ethiopia's economic reality remains grim. Less than 2% of citizens have access to the Internet. Only 34% of Ethiopian children get as far as the equivalent of 9th grade. Early adult literacy is approximately 35%, child labor at 27%, girl marriage an appalling 41%, and the country still ranks near the bottom of the UNDP's World Index for quality of life. At the hub of this tech growth is an AI group, iCog Labs, co-founded in 2012 by a young Ethiopian roboticist, Getnet Aseffa Gezaw, and an American AI pioneer, Ben Goertzel. With a team of twenty five Ethiopian software engineers, iCog pursues full-on 'Strong Intelligence,' the conviction that computers can potentially emulate the entire human brain, not just aspects of it. The ambitious lab has a bold mission: to create software that not only simulates the brain, but pushes the envelope of what the brain can do. The lab also focuses on a host of practical applications for clients around the world, including humanoid robots for Hanson Robotics, makers of the renowned Robot Einstein; AI-driven automated pill dispensers and elder-care robots for a Chinese company, Telehealth; and mapping the genetics of longevity for two Californian corporations: Age Reversal Incorporated and Stevia First. iCog also delves into 'deep learning' algorithms for vision processing and object recognition (used in drones, satellites and security systems), machine learning algorithms to predict patterns in everything from agriculture to electricity consumption, and algorithms that react to English and a host of African languages. iCog's humanitarian work includes developing software for AI tablets for children--distributed to Ethiopian villages--with games that help children teach themselves elementary coding, mathematics and English. The endeavor builds on One Laptop per Child's initiative which earlier distributed thousands of tablets to rural children to help them learn computer programs in the language Squeak. iCog recently doubled its office space and has collaborated with Addis Ababa Institute of Science and Technology to form the first post-graduate AI program in the country. It is also a major contributor to the OpenCog foundation, the largest open-source AI group in the world, co-founded by Goertzel and based in Hong Kong. Other labs are laying a foundation for AI developers to work in Ethiopia's native Amharic language. EthioCloud created the first advanced Amharic code programming language, which runs on Microsoft's .NET and C# platforms. The company also developed an optical character recognition program to convert Amharic paper documents into editable text and an Amharic text-to-speech conversion system. 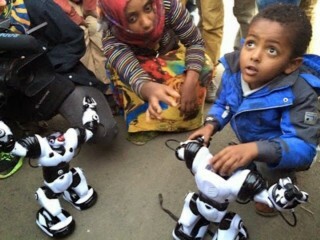 Current AI ventures and supporting infrastructure projects, which will all be Ethiopian-operated, include a $1.4 billion mobile phone deal for Ethiotelecom to install network-quality-assessing robots in moving vehicles for mobile calls; advanced Chinese-built QoS (quality of service) ambient intelligence for the communication networks in its massive $4 billion electric Light Rail project, the largest in East Africa; French/US machine-learning self-diagnostic intelligence software to support the Blue Nile's $5 billion Grand Renaissance Dam, the largest hydro plant in Africa (which will also come with its own tech park); cement loading robots, quality assessment robot technology and a robotics lab for Dangote Cement, the largest cement plant in East Africa; and self-diagnostic intelligence for power grids of the Ethiopian Electric Corporation and the Ashegoda Wind Farm, the largest in Africa. The stage is also ripe for AI to go into other mammoth projects including a $4 billion US-Icelandic geothermal plant, one of the world's largest; two deep space telescope observatories coupled with multi-billion dollar satellite plans; integration of intelligence into the country's own fleet of locally manufactured drones; and factory robotics into its rapidly growing, $10 billion dollar industrial tax free zone, primarily for Chinese companies seeking to outsource labor from $30 a day per worker in China to $1 per day in Ethiopia. Today, the country has become Africa's 3rd largest recipient of foreign investment and its largest recipient of developmental aid. "Technological leapfrogging" is a term that proudly buzzes around the ministries and tech community of Addis Ababa and other African cities: the notion that advanced technology in developing nations can help them bypass the bureaucracy of older systems elsewhere. The concept is hugely attractive, but if basic human conditions don't improve, all this high-tech, artificially intelligent economics will end up as just artificial, neocolonial circuitry hubris. The country needs rapid progress in health, education, representation, labor rights, and private sector GDP growth (now the 6th lowest in the world). It needs to end the forced relocation of entire communities, with little to no compensation, to accommodate the government's mega-plans. These real challenges still starkly face what could be one of the most promising economies in Africa. Ethiopia has a uniquely rich history of pioneers. It is the presumed birthplace of Homo sapiens as well as Africa's oldest independent country, and the cradle of culturally-advanced, fiercely-independent kingdoms dating to the 8th century BC. It is one of first 24 members of the United Nations and the first African country to join the League of Nations, the protector of some of the most important heritage sites and a multitude of record breaking scientists, Olympians and marathoners. If the Ethiopian people can progressively claim their country, they may help mankind leap from Homo sapiens to homo cyborg and beyond.